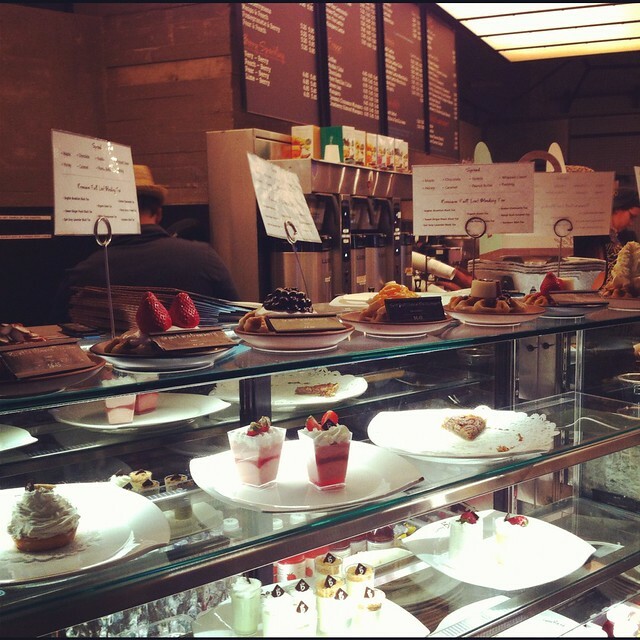 There’s coffee, tea, smoothies, gelato, waffles and pastries, the best part is the quiet and spacious seating area. Times Square needed a place like this! 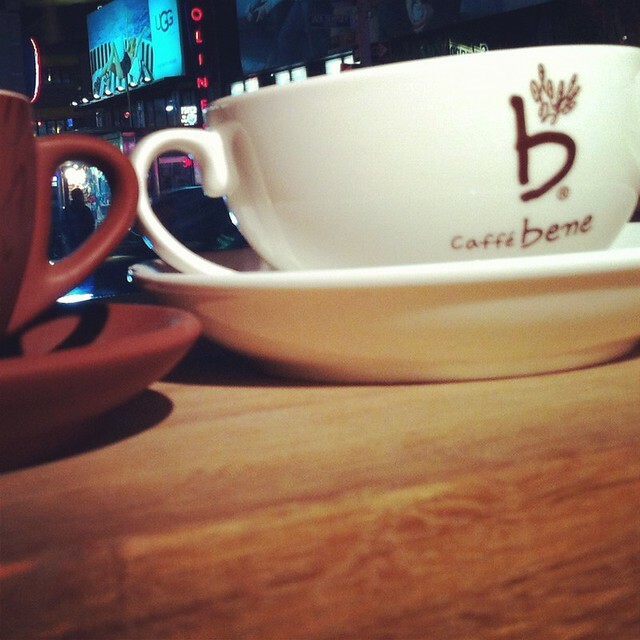 We welcome you Caffe Bene, we welcome you. 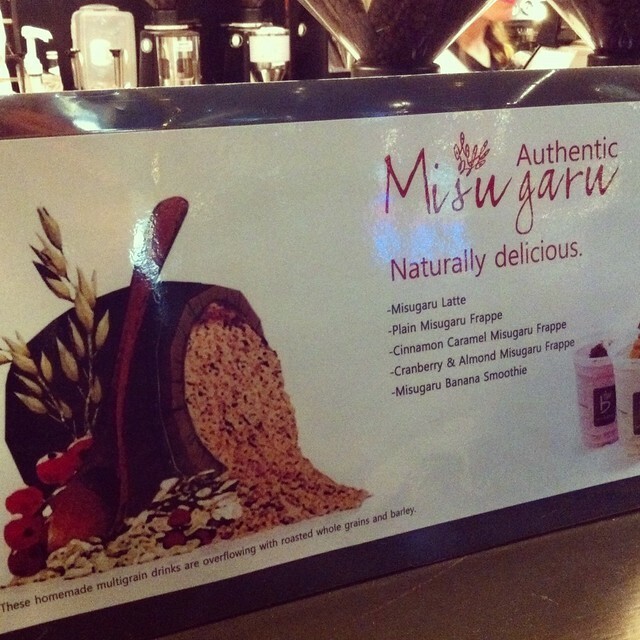 Misugaru is a multigrain drink. High in protein, which boosts energy and is easy to digest. It’s a healthy good for you kinda drink. It comes in powder form (black sesame seed, black bean, black ride, brown rice, barley). It’s a very popular in Korea, when I visited a couple years ago, they would grind it fresh. Here in the States, you can buy pre-packed ones at Korean grocery stores. 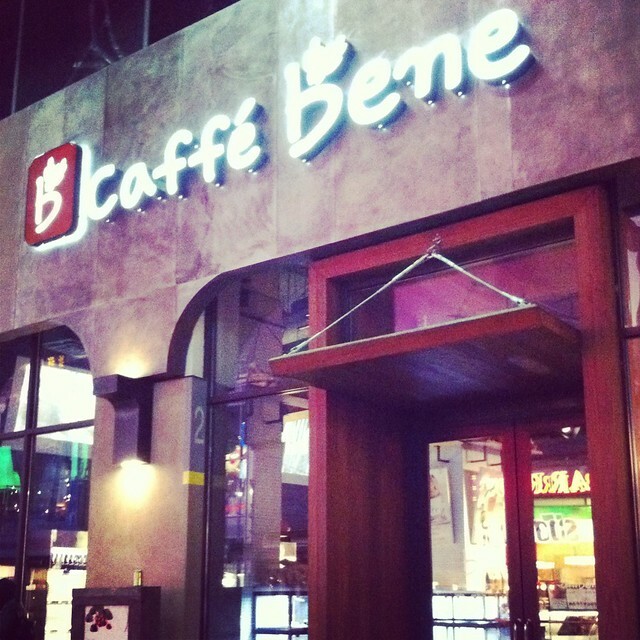 Before Caffe Bene came to town, I would get my fix at the tea shops in Korean Town. 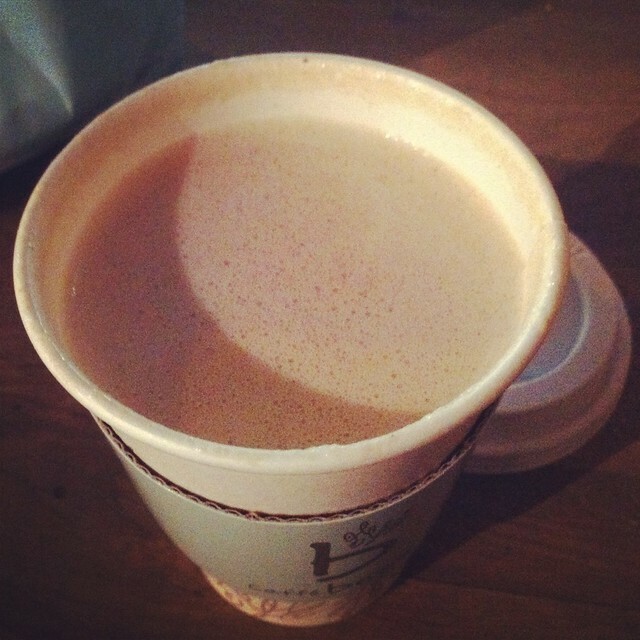 Misugaru Latte is steaming and nutty. It has an oatmeal/peanut butter smoothie flavor only a bit more grainy. Thick enough to keep you full for a while, it could be meal substitute, although at Caffee Bene it isn’t super dense (I’ve had it really thick elsewhere, I prefer this). For a cold option, the Misugaru Frappe is quite good, not too sweet. 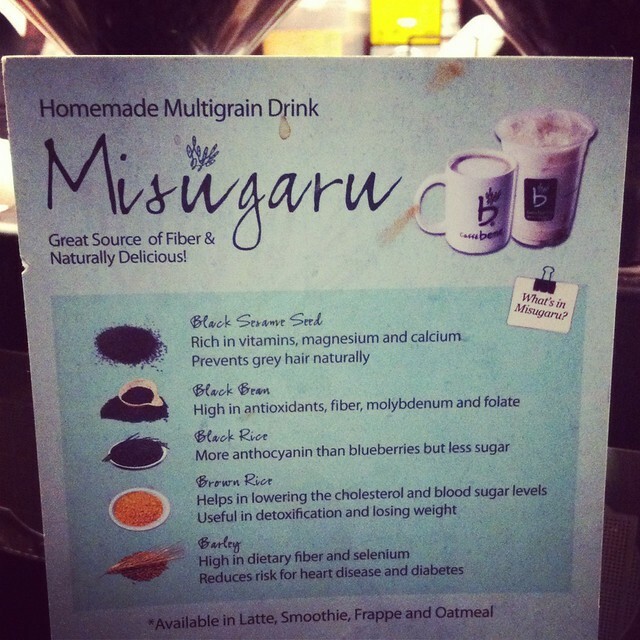 I like the plain misugaru better, I find the natural flavor comforting. The first time I ordered the latte it was so so hot, I burned my tongue so badly, it made me think of a lawsuit! yes, that bad. But during my last visit, they seemed to have managed that. 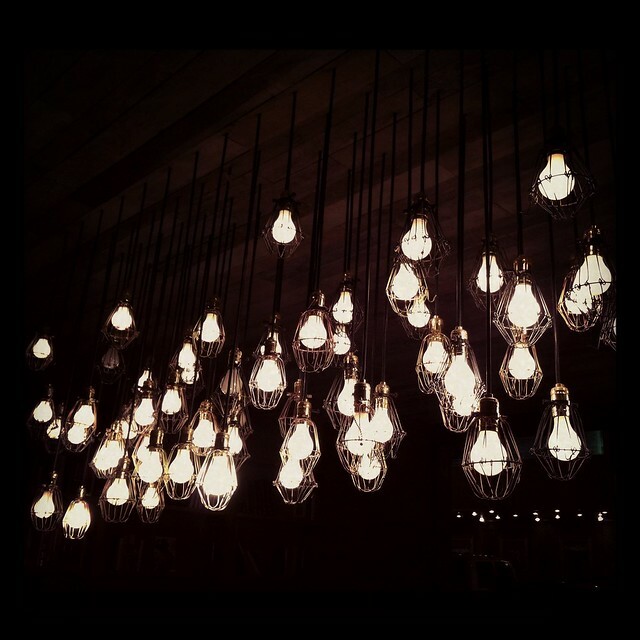 I love the lighting and the study/living room at the back. Very inviting and warm. 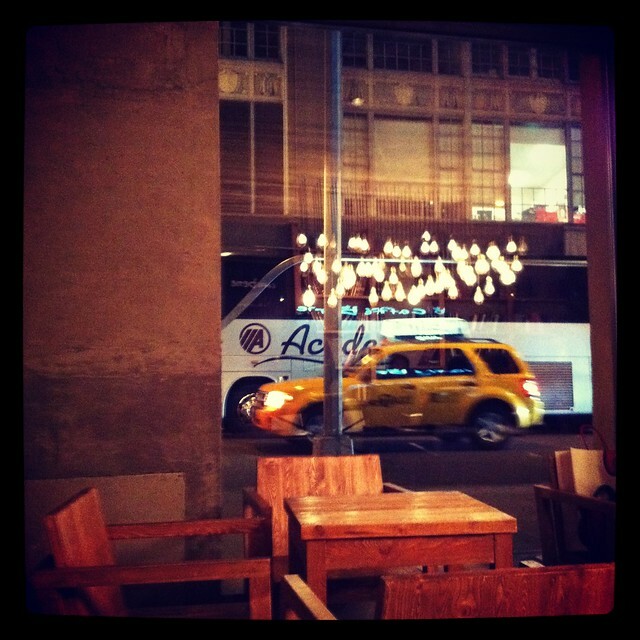 There’s nothing like escaping Times Square in the middle of it. Very chill you can surf or do some reading. Yes, you can touch/read the books. The waffles on display are very very tempting. They use a pre-made dough. I found it super dense, I think the middle wasn’t cooked properly. 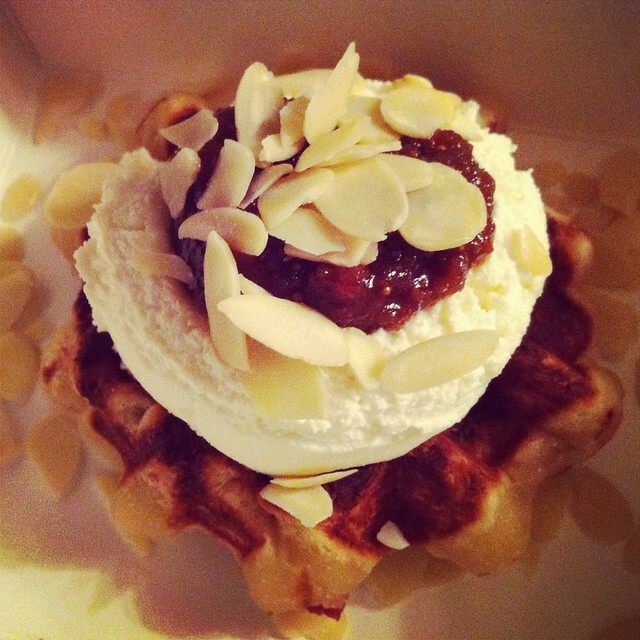 The topping of ricotta cheese, figs and almond were a let down by the bad waffle. Which is a shame, I really wanted to like it. 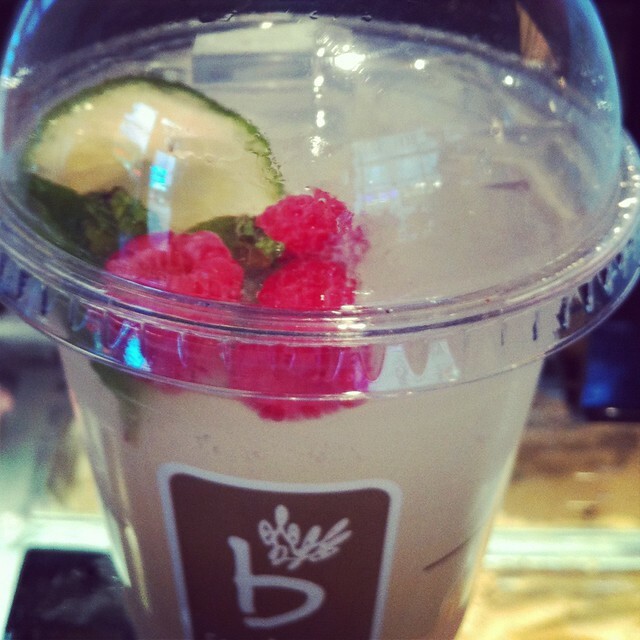 The Pear-Berry Sparkling looked pretty, but was way too sweet for me. As the ice melted, it was better and a good alternative to caffeine, but the amount of sugar was a turn off. 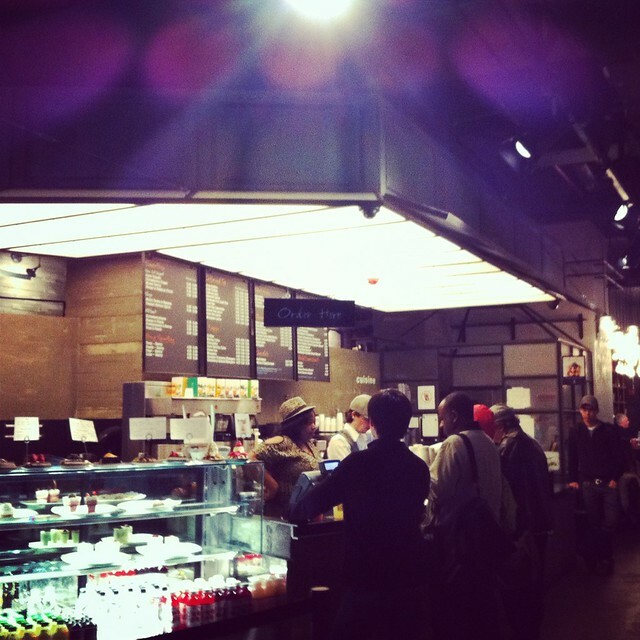 Their blood orange donut was like the waffle, had the looks but nothing else. Dense and overly sweet. 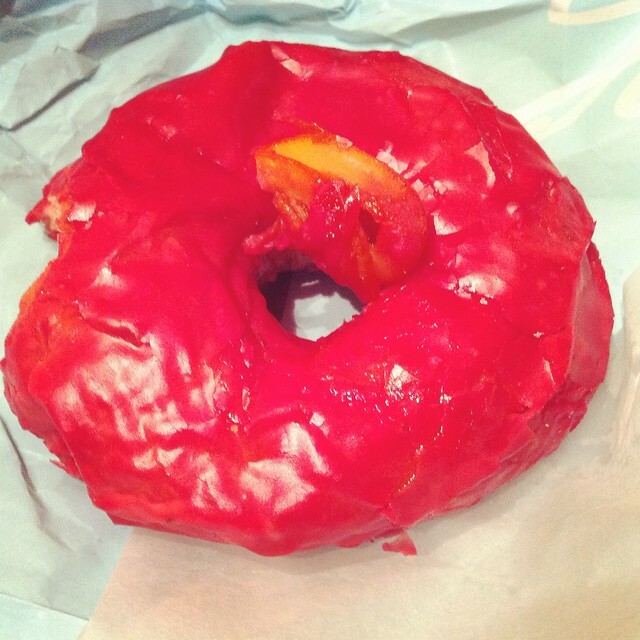 None of that fluffy soft pillow donut Homer Simpson is addicted to. 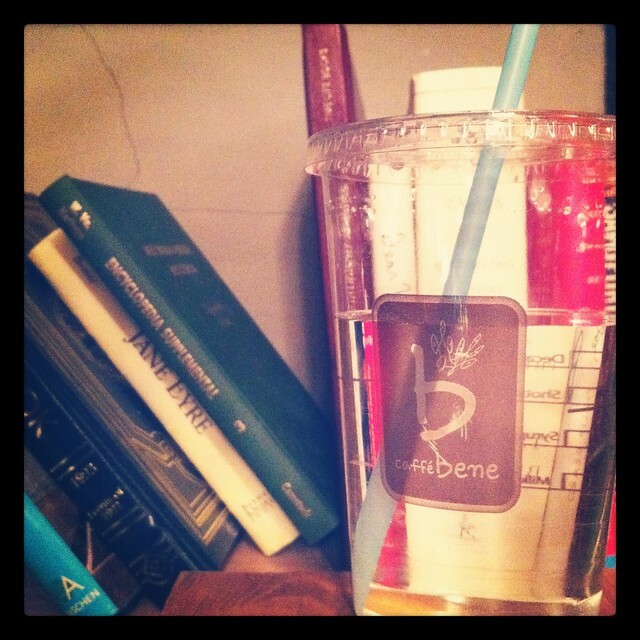 I’ve been back to Caffe Bene a couple times, before and after shows. I simply stick to the drink and take in the cute space. The bites however, were a turn off so far and I would probably stay away. that looks like a moffle to me, meaning the inside was mochi, not uncooked. It is? I’ve never had a moffle, but the menu said waffle, at least the one I had. Would love to try a moffle sometime! 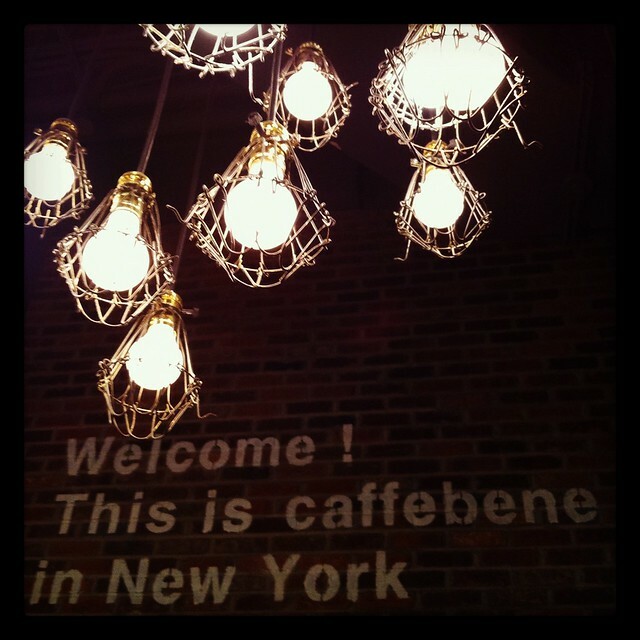 I haven’t seen it in NYC, have you? I agree with the review posted here. 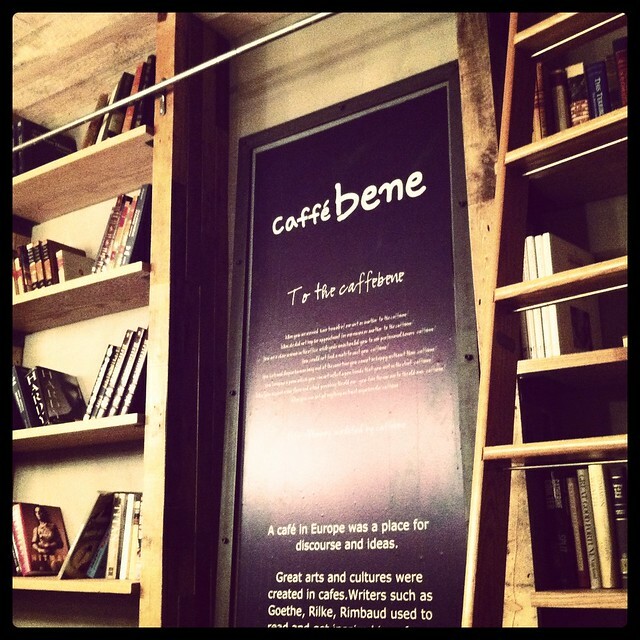 The only great thing about cafe bene is the space. I love the look and can’t get enough, but majority of the food choices (I’ve tried many, hoping to find one that I like) are mediocre. It’s unbelievable how such a beautiful place can serve such horrible food and drinks. Even the coffee tastes like watered down stakes coffee.